The end of Atari didn’t come as a shock for those in the 80’s who got hooked on those dinky little cartridges that were worth more than gold to those who witnessed love at first play with Atari. But what really created the final hole in the deck of Atari’s ship? Yes, the very much deplored game version of a very much devotedly loved film, E.T. i.e. 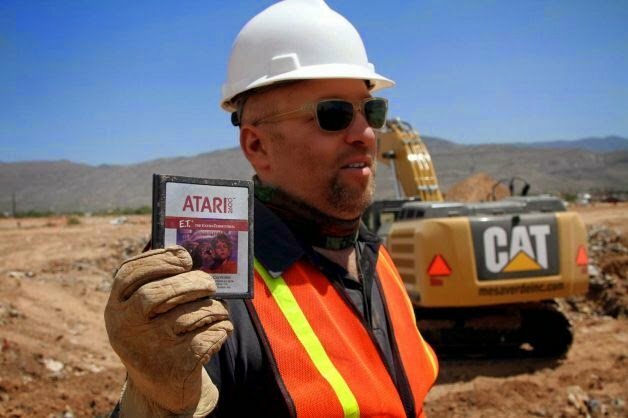 Recently a film production company found buried in a New Mexico landfill thousands of the Atari E.T. game cartridges that made this game and the Atari as a company, centre of attention once again after almost 3 decades. What was so bad about this game that sank an entire company to the depths of near anonymity? Tina Amini, deputy editor at gaming website Kotaku, says the game tanked because “it was practically broken.” A recurring flaw, she said, was that the character of the game, the beloved extraterrestrial, would fall into traps that were almost impossible to escape and would appear constantly and unpredictably. The company produced millions of cartridges, and although sales were not initially bad, the frustrating game play prompted an immense amount of returns. “They had produced so many cartridges that were unsold that even if the game was insanely successful I doubt they’d be able to keep up,” Amini says. Hence the company decided to dump the entire stash and bulldozed it. There’s a lesson in it, not only for the game developer fraternity but also to the IT industry at large. First, it’s not necessary that one product that is successful in a particular genre would necessary reap the same reward in another. Second, be thoughtful, thoughtful about your product life cycle, especially so if you’re in the IT industry. Do a thorough research, weigh the pros and cons carefully, carry out extensive testing, and only then would you be able to decide whether to throw a product in the market or not. The IT industry, however unlikely, CAN draw parallels to this situation with Atari’s E.T. game fiasco. It is a case study that reminds us of the importance of treating your consumers, users, customers and clients with respect as a responsible as well as sensible business entity, more important so for the IT companies as they’re the torch bearers on the path of leading humanity to technological innovations.